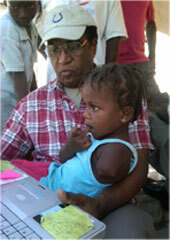 Two year old quake survivor Sarafina with Pierre Leroy, HPSP founder, January 2011. HPSP is helping Sarafina get a prosthetic device. The island of Haiti and the Dominican Republic is known as Hispaniola, Little Spain. The 18th century Spanish colonizers, who compared its beauty to part of Spain, gave it that name. Hispaniola offers the exposure of two cultures existing side by side on one island. The western part of the island, Haiti, consists of predominantly African and French descendants, while the eastern part, the Dominican Republic, is mostly Spanish and Indian descendants. While there has been some friction between the two countries caused by political, language and cultural differences, HPSP promotes intercultural activities and solidarity between these two neighbors. HPSP distributes toys on Christmas to poor children in the DR.
HPSP gives support to two elementary schools in the Bateys near Santo Domingo. HPSP promotes an intercultural program between Haitian and Dominican students. HPSP contributes to the Cross Cultural Center in Santo Domingo, located at #2109 Calle Isabel La Catalica. HPSP helps support seven former residents of Maison d’Espoir Orphanage and other disadvantaged students in Haiti as they complete their BAs at UTESA University in Santiago and agricultural school in Constanza.